Sunday was the Madewell styling event and preview of the new fall 2012 line. There were so many bloggers attending and their invited guest. It was a great evening. 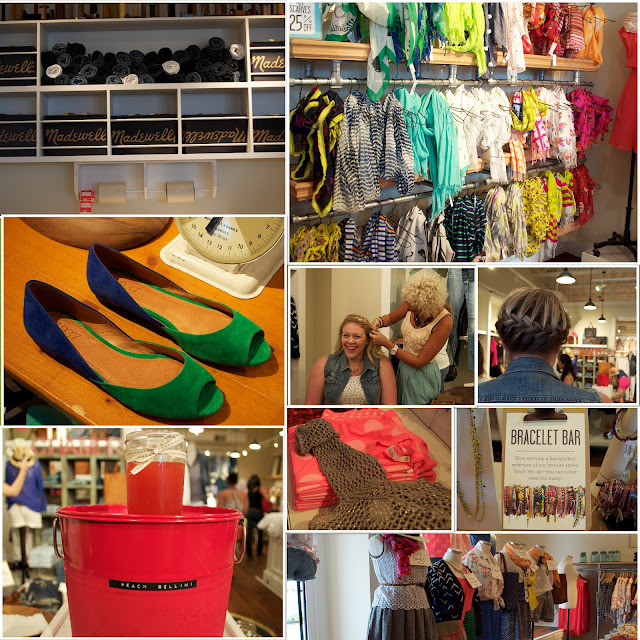 Big thanks to Meggy for hosting the event, and Madewell for allowing us to pretty much take over their store! Here are a few highlights from my evening and of course my purchase. So many pretty colors, there was a braid bar and Meggy having her hair done. We sipped on Peach Bellinis, nibbled on a few sweet snacks and lots of shopping. Erin from Pretty Polished Perfect won the gift card! Yay for Erin! Katie, the store manager had pulled a few items for me before I arrived to try on. She did great and I purchased several of the items she thought I would like! So here is what I purchased. This fabulous cream tank with heavy black embroidery work all on the front, a black tank with chevron open stitching on the front, (the detail doesn't show too well in the photo) this great scarf in an ombre fashion of black and cream that has hello goodbye printed all over it. And we all know my love of a good arm party. Sandy was sporting a lovely one and I had to snap a pic! What a fun event! Great pics! Looks like you ladies had a great time. I can't wait to shop these looks! Thanks Sara. It was a great evening with so many new faces. You should definately check out Madewell. Oh man I SO wish I could have been there!! It looks like it was such a great time! LOVE those blue and green shoes!